A group of optimists will attempt to banish "Blue Monday" with free comedy and cheer packages for celebrities and others "in need of a lift". The Optimists' Society say they want to reclaim the "most depressing day of the year" as International Optimism Day. This year "Blue Monday" - a date in January regarded as the most depressing day of the year - falls on 19 January. 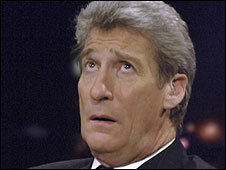 The society will send cheer packages to celebrities such as Jeremy Paxman, and will host a free comedy show in London. This year's Blue Monday comes amid economic turmoil due to the credit crunch, with fears of continued economic gloom and job losses - which the society believes is all the more reason to adopt a positive attitude. James Battison, founder of the "loose-knit social-action group" said: "As an optimist you get to bathe luxuriously in your own good-feeling, while also sparking some fun and laughter in others. It's a win-win way to live. I highly recommend it! "The key to feeling positive lies in taking action and making other people smile. Remember, life could always be worse, but with positive action things will always get better." Cheer packages are also being sent to Chancellor of the Exchequer Alistair Darling, Radio 4 presenter John Humphrys, famously straight-faced comedian Jack Dee and the cast of the BBC soap EastEnders. In London, a free lunchtime comedy show will be held at the Comedy Store, featuring a motivational session from comedian Neil Mullarkey. The Optimists Society describes itself as "a social-action group promoting positivity and helping people make a difference to themselves and others through simple actions".